You’ll Say "WOW" Everytime!! | Down With Cantaloupe! 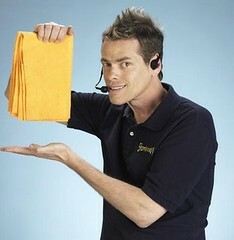 The Sham-Wow guy, also known to those who love & adore him as Vince Shlomi (I know, right?? ), has been involved in a violent confrontation with, well let’s just call her a Lady of the Night. If ya know what I’m sayin’. Sham-Wow Vince has no time to meet a nice lady (we’re assuming) because he’s very busy making messes and showing people how to clean them up WHILST wearing a McDonald’s-like microphone. Because everyone needs 2 hands to wipe up juice, yes? Apparently things went horribly awry when said “lady” clenched onto Sham-Wow Vince’s tongue. Fighting ensued. And Sham-Wow Vince came out saying WOW…only not in the way he was expecting. Personal opinion, Sham-Wow Vince got exactly what was coming to him because everyone knows by now not mess with these chicks. (Charlie Sheen, Hugh Grant…need I say more?) Only on top of the public embarrassment of having to pay for kisses, Sham-Wow Vince also got the ever living daylights beat out of him. Check the article out here and enjoy your Monday!